Another incredible coral find from Joe Knows Reefs . 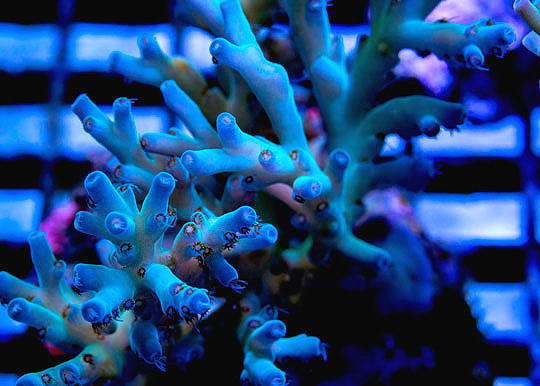 This Joe’s Ice Queen Acropora LE develops glacier blue corallites and cream turquoise colored branch stems. Corallitels are also very elongated and similar to A. echinata corallites, but not quite as long as A. echinata. These qualities are somewhat similar to the Ice Fire Echinata coral, but in addition to those similarities, the Ice Queen also has some interesting pigments within the corallite polyps. There appears to be ice blue centers to the polyps surrounded by dark red pigments. These pigments form an almost crown type of configuration. This coral has some incredible morphological possibilities in captivity. The Joe’s Ice Queen Acropora was imported in May of 2014 as a maricultured coral from Indonesia, but Joe believes that it was obviously just a wild coral section glued to a culture type base mount. The coral initially started bleaching due to shipping stress and Joe was worried he might lose the coral. He placed it in lower light and less flow thinking it was shipping stress, but the coral did not improve. So he then placed it in strong light under a 400 watt halide and within moderate flow. The coral responded well and has been fully recovered since July 2014. Even though this coral has physical characteristics similar to deep water acropora, it appears to be a shallow water coral that does better under bright light and moderate flow. Its exotic pigment qualities also developed in the stronger more exposed conditions. Reeffarmers is maintaining a seed section of this coral in a 8 foot Raceway Gyre BiZonal system. This system is naturally filtered with a semi-cryptic zone and a reef flat exposed zone. In this captive reef the coral is positioned to receive strong to moderate light and moderate water current. The first edition fragment of this coral was sold privately. Recommended list price on December 18th 2014 was $140 for a small fragment. Greg Polec acquired the first edition fragment.